Who says PC Gaming is dead? That's the question Nvidia GeForce boss Drew Henry posed the crowd as he unveiled the 3-billion-transistor strong GeForce GTX 480 here at PAX East 2010. 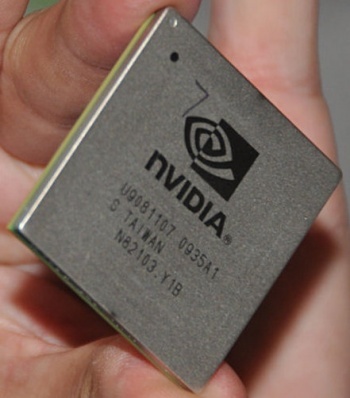 Back in December, we learned that NVidia's next GPU would feature a mind-blowing 3 billion transistors. Today, we got to see it in action on the giant screen of the main PAX '10 theater. "We build the products for you guys," GeForce General Manager Drew Henry told the crowd. "When our engineers wake up in the morning and try to think of what to build, they're thinking about you guys. You're the people we design these products for, and we try to launch them at events like this." Henry then introduced the brand-new GeForce GTX 480, a very snazzy-looking, sleek chrome card that he calls the "coolest-looking GPU that the industry has ever seen." Beyond that, though, Henry also called it "without a doubt, the best GPU we've ever built." It has 3 billion transistors, he reiterated, which is the same as four quad-core Intel Core i7 CPUs. Alongside the GTX 480 was the GTX 470, its little brother - presumably not quite as powerful, but almost assuredly a bit easier on your wallet. In terms of pure numbers, Henry compared the new 480 to its predecessor, the GTX 285 - "hands down, it was the best GPU on the marketplace, and something we were very proud of." But when comparing performance from the 285 to the 480, the new card had more than double the performance on games like Crysis Warhead, H.A.W.X. and Metro 2033. It's unclear what "twice the performance" means, but having double the output of one of the best cards previously available is certainly an impressive thing. The card invests in physics technology and "real-time, interactive ray-tracing," said Henry. "We want to let gamers tear it up, blow it up with physics, dial it up with ray-tracing, and in general just crank that sh*t up." It also supports 3D surround - on three huge projector screens, no less. EA DICE's Gordon Van Dyke took the stage to demo Battlefield: Bad Company 2 in 3D on these huge screens, and it looked very cool. I was seated off to the side a bit so it looked a bit blurry, but even so there was a very tangible feeling of depth that the ridiculously widescreen display only intensified. We also saw a less graphically intense game: World of Warcraft. While the only "action" consisted of flying a special proto-drake through Zul'Drak, the scenery did look really cool in 3D. It was very choppy with pretty low FPS (Zul'Drak is notorious for that even in 2D), so I have concerns about performance - but it's hard to communicate how cool it looks to fly through an aqueduct archway and see it going around you. After that, we checked out the new Need for Speed, and the level of fidelity in the "cockpit view" was really impressive. The 3D didn't work too well when looking at things in the distance like signs (that may have had something to do with viewing angle) but the steering column and dashboard looked phenomenal. The GTX 480/470 will also ship with a "garage" app that lets you look at models of cars in real-time and experiment with the real-time interactive ray-tracing. We saw one of the NFS cars, a 200,000 poly-count car "accurate to the millimeter," and the man in charge fiddled with settings like the angle of the sun and the rotation. Of course, the reflections on the hood and windshield warped and adjusted accordingly. There was some slight grain for a few seconds after he changed the settings but it quickly went away. Henry also showed off a little app that will come free with all GFX 480/470 units called Supersonic Sled, a physics demo featuring a crazy stunt driver named Barney who is essentially strapped down onto a sled with a giant rocket engine. It has a very cartoony feel, but the physics looked awesome - he crossed a bridge and it collapsed due to the speed, and when he reached the end of the track without stopping he just flew off over a magnificently huge canyon. More impressive, though, was what happened when you dialed the debris up - on full settings, the collapsing bridge contained a mind-blowing 1 million pieces (putting those 3 billion transistors to good work, I see). Equally as cool-looking was putting boxes filled with feathers on the track. When Barney plowed through them, the boxes shattered into thousands of shards (and Barney went flying), but what was cool was how the physics engine treated the thousands of feathers differently from the wooden pieces. We finally took a look at THQ's new Metro 2033, and while it looked cool in 3D it kind of paled next to watching a bridge collapse into millions of little chunks, especially given that Supersonic Sled will be free with every GFX 480/470 GPU. Ah well, them's the breaks. The GFX 480 and GFX 470 will be in stores in approximately 14 days, said Henry. So if you're the type who needs the absolute best hardware for his PC, look out for NVidia's latest tiny gods in early/mid-April.